Snow Forest Christmas Escape info about the game-Games2Rule. 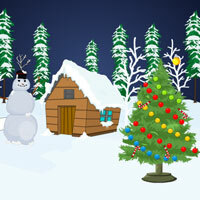 Snow Forest Christmas Escape is a type of point and click new escape game developed by games2rule.com . You're trapped in a Snow forest during Christmas holiday. How your mind will work if you are really trapped in such a so cool place. No one is there to help you. Use presence of mind to utilize the objects found in the place to make an escape from there. Good luck and have fun!